Fully Automatic, User Friendly, Sticker (Self-Adhesive) Labeling Machine Mode SBSL-120 (S), Suitable for Labeling on Vials, Bottles and other round objects. The Fully Automatic Labeling Machine incorporates latest sophisticated Micro Processor Controlled Stepper Motor Drive, Fiber Optic Label and Container sensing system. Manufacturer & supplier of complete packaging line including liquid filling lines and turn key projects. Our product range includes machinery for production in various fields: foods, chemical, pharmaceuticals, soft drinks, wine-making industries. We develop superior and reliable products for the global market. Is aggressively pursuing cooperation with international companies and seeking to consolidate our global presence through globalization. excellence that facilitates continuous innovation. excellence that ensures product reliability. excellence that enables superior workmanship. excellence that transforms into customer satisfaction. 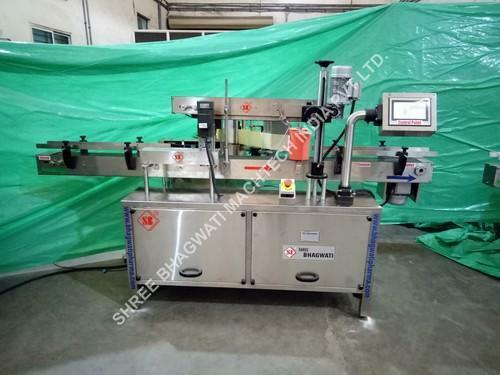 Company has got great achievements in the pharmaceutical, food & cosmetic manufacturing equipment field through the execution of our brand name “shree Bhagwati” -developing strategy. Our products are well popular in Indian pharmaceutical, food & cosmetic industry and have a good reputation in abroad.